Impress family and friends over the holidays with a decadent treat when you turn the season's most festive tipple—eggnog—into a pie. 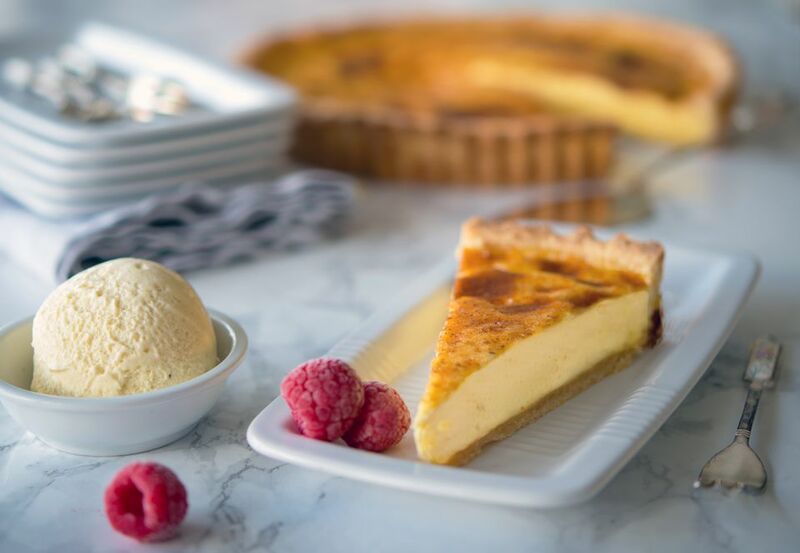 The creamy, boozy egg custard sits in a sweet pastry crust and makes a perfect dessert or tea time treat come Christmas. In a rush, use store-bught ready-made sweet pastry to save time. Gather the ingredients, making sure that the butter is cold. Do not use at room temperature. Grease a 9x1 1/2-inch loose-bottomed tart tin with a little butter and set aside. Place the flour, butter, and sugar into a large baking bowl. Rub the butter into the flour with your fingertips until the mixture is like coarse grains of sand. Add the egg and stir with a cold knife to bind the mix. If the pastry is dry and not binding, add the milk one teaspoon at a time and keep mixing. Generously sprinkle a work surface with flour, gently roll the pastry, and line the tart tin. Trim the edges and place into the refrigerator for at least 30 minutes. To make the pastry by machine: In a food processor, mix together the flour, butter, and sugar on a pulse setting until the mixture resembles coarse sand. Add the egg, slowly, through the funnel until the dough comes together in a ball. Add milk a little at a time until the pastry binds together. Roll and rest the pastry as in step 3 above. Beat the eggs and egg yolk in a stand mixer, or by hand, in a large clean bowl until light and frothy. Gently warm the cream with the cloves over low heat being careful not to boil or the cream may curdle. Add the brandy and stir well. Slowly pour the warm cream over the eggs, stirring constantly. Cook the tart in the middle of the oven for 10 minutes, lower the heat to 350 F, and bake for 20 more minutes until the eggnog filling is almost set and the surface a lovely golden brown. Serve the pie ever so slightly warm with vanilla ice cream or whipped cream. Store the eggnog pie inside an airtight tin in a cool place, never in the refrigerator. The pie will keep for 24 hours. The pie can be frozen for up to one month and defrosted overnight in a cool place when needed. This recipe uses Brandy, but feel free to sub in rum or whiskey if you prefer.